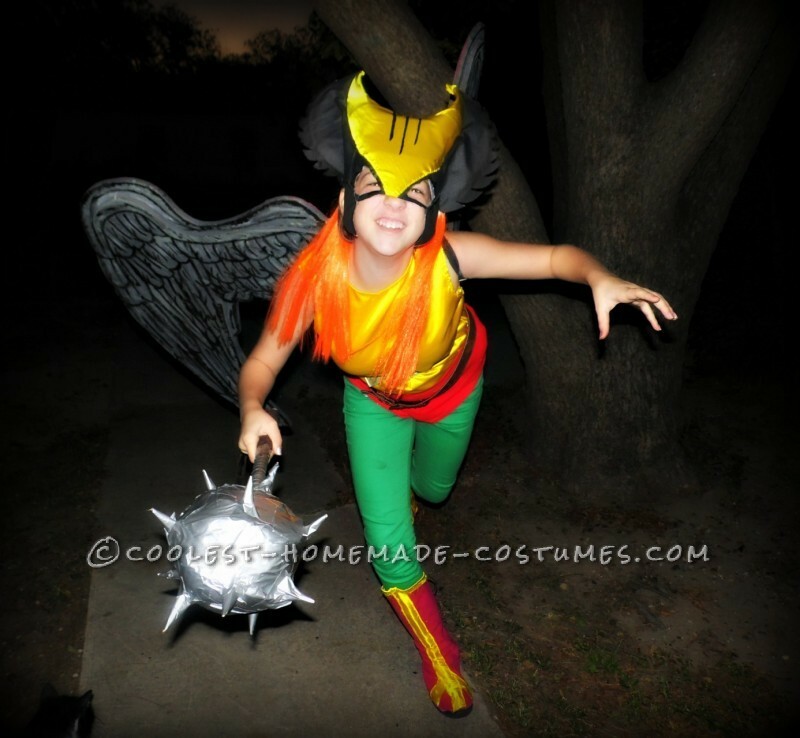 My daughter Linda wants to be Hawk Girl this year so I started brainstorming as to how I was going to do this. I used pictures as reference and started immediately on the helmet. The helmet is finally done. Was a trick to put it together, looks good but it was a monstrosity to put it together. 3 baseball caps, dremel tool, black paint, black and yellow scraps and a witch hat with orange hair that I tore to shreds, and TA DAAAA. Now to get started on the boots then the mace. I cut up the brims of the baseball caps to form the sides of the helmet and sewed them together. I then patched everything together by overlapping and sewing. I had to use the dremel tool to drill holes in the plastic rims in order to sew the padding ( scrap material ) and yellow cover. 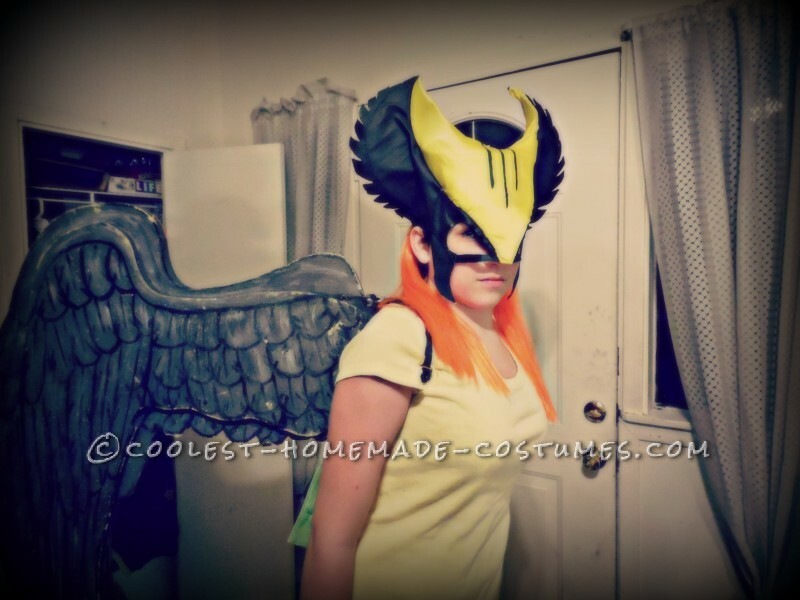 I used the plastic rims from the witch hat to form the curves of the wing part of the helmet. Okay I know, there ‘s a method to my madness. I drew and cut patterns from a red t-shirt and black vinyl with fabric attached to the back. I then glued the fabrics together with Automotive headliner adhesive. I intended to use zippers on the back of these but alas, I have none, so it ‘s leather lace up the back, just have to have Linda measured for the front and top of the boot so I can sew these up. 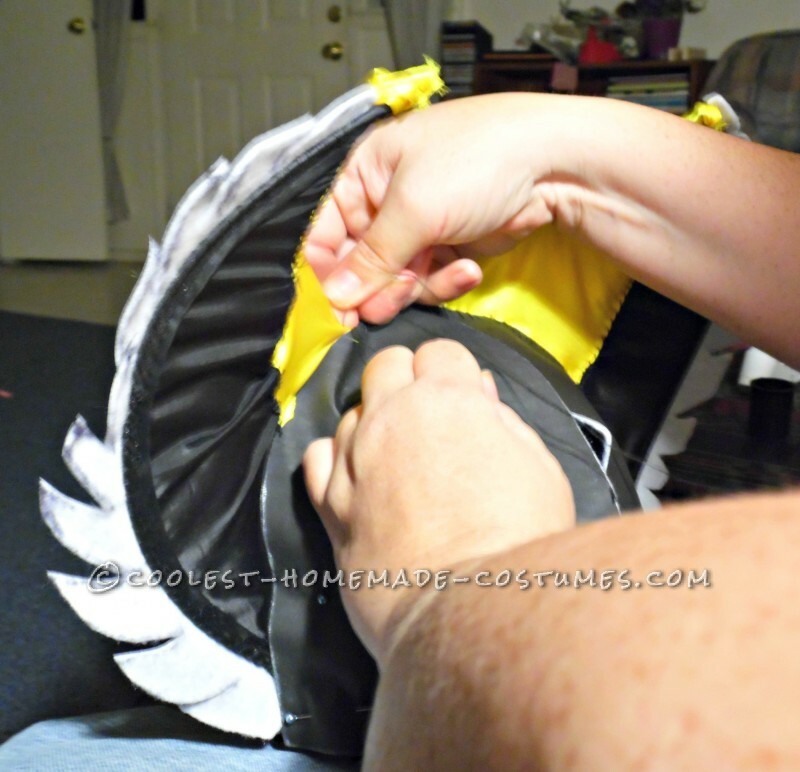 Will be making the yellow hawk accents once the boots are sewn together. I hand sewed the boots at the same time yielding blister after blister… ouch! If I had to type with my thumbs I ‘d be in agony. Boots fit Linda and decided I ‘m going to hole punch the back and go with black leather lacing… less painful and easier. That should cover the seams on top. 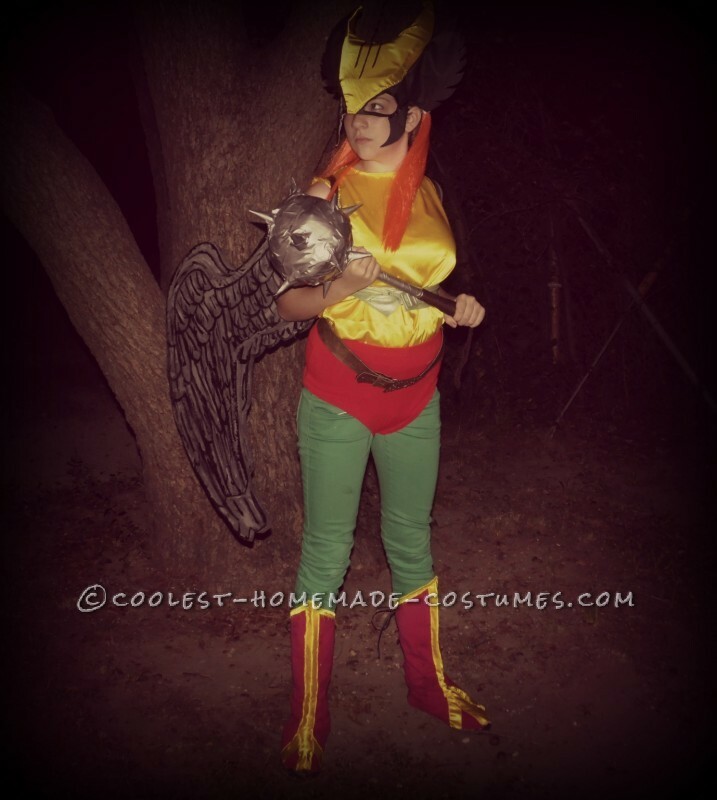 Mind y ‘all… I have not spent one dime on this costume, I ‘ve grabbed stuff around the house to do this. 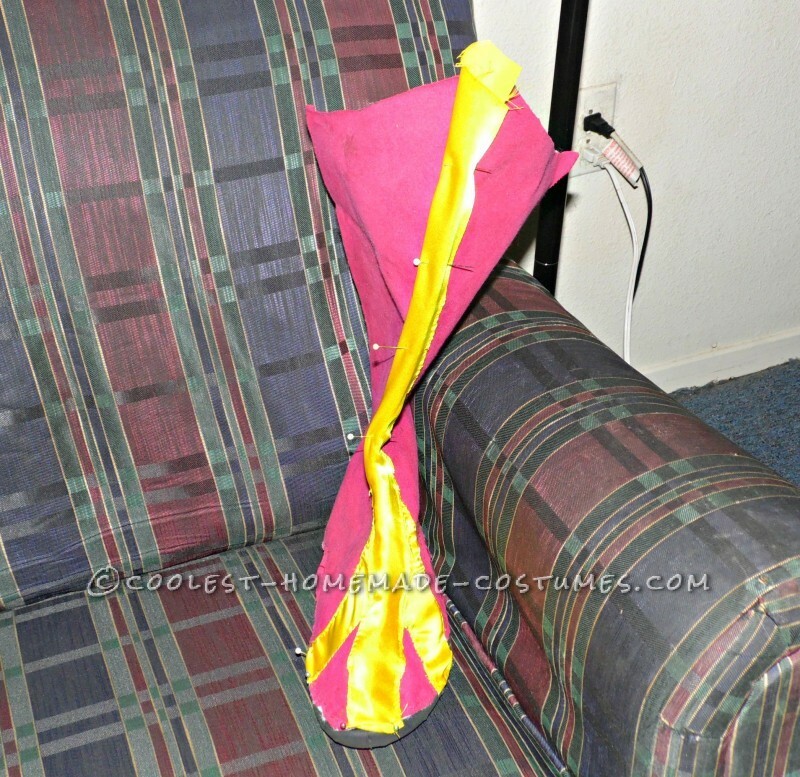 Well I ‘m going to take a short break on this costume, just finished the mace… LOL how did I make it? 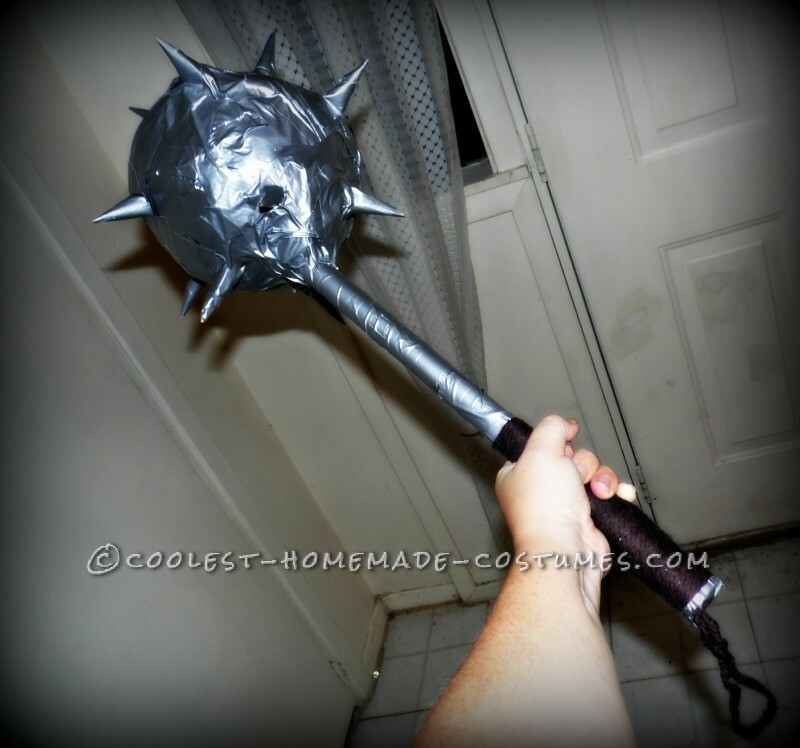 Part of a broken metal broom handle, garbage, scraps from the boots, two old glow necklaces for ball frame, brown yarn, and crap loads of everyone ‘s favorite… duct tape. 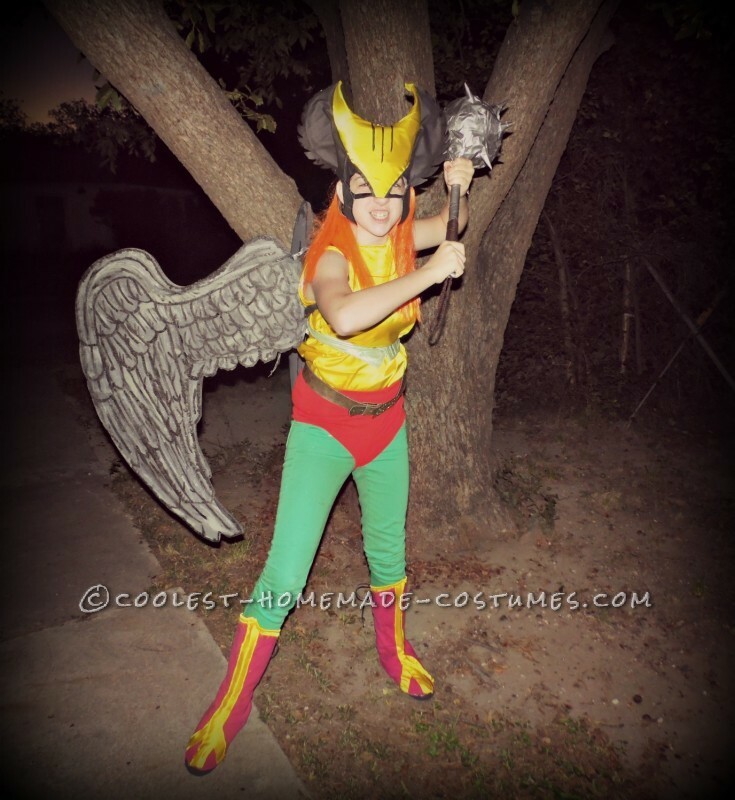 As far as the wings they are made from a Styrofoam sort of material. 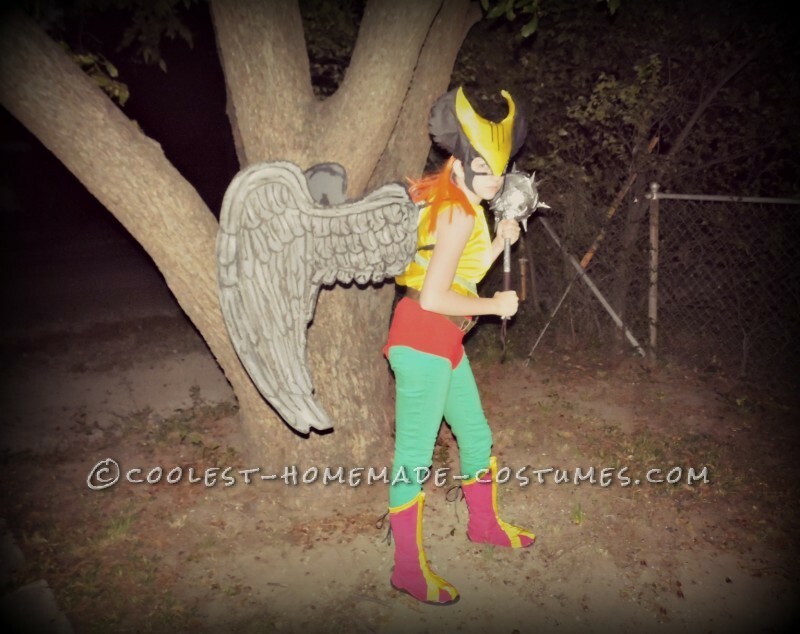 I used those wings with the Weeping Angel Costume I had entered last year. Update on costume, finished top and now working on trimming on boots. Lost feeling in fingertips due to too much sewing…. using pliers now. Good news.. haven ‘t broke any needles on this costume yet. 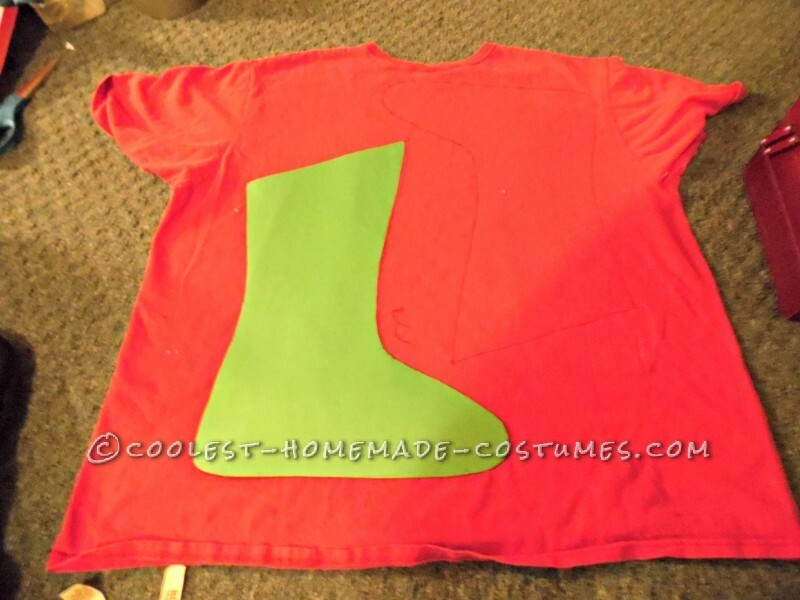 Hemmed a tiny red pair of shorts for part of costume and Linda luckily had the right color green skinny jeans which complimented the costume nicely. 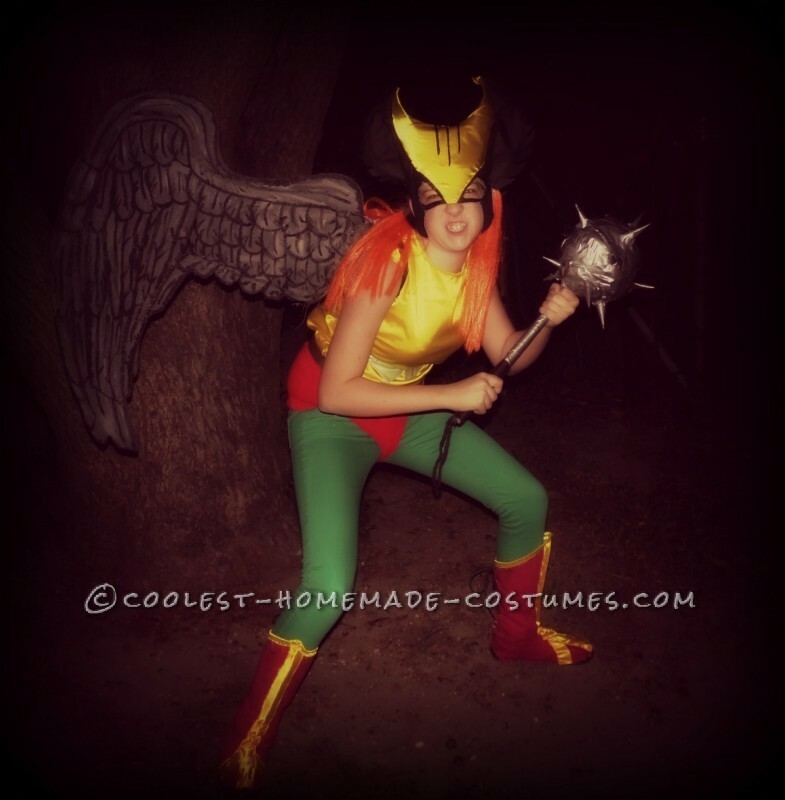 Finished the costume and Linda is totally satisfied…. mission accomplished.